This post originally about four and a half years ago so I figured it was time to update the photos and story a bit. These Quick and Easy Pizza Quesadillas are really that–quick, easy AND delicious! A tasty twist on a traditional quesadillas recipe that combines the favorite flavors of pizza, they are perfect for a snack or light dinner. Pair it with a salad and you’ll be set for a healthier meal too. I normally use turkey pepperoni as it’s lower in sodium and a tad better for you. But what I also like about these Quick and Easy Pizza Quesadillas is that I can add in some vegetables and my family does not mind! I usually add green bell peppers and onions but I’ll occasionally add some mushrooms too (only a couple of us are fans of those–well, really I’m a lover of mushrooms!) I sprinkle a bit of Italian herb seasoning along with the mozzarella cheese, pan fry them up and voila! I’ve got a tasty snack, lunch or light dinner idea. I normally serve the Pizza Quesadillas with some Homemade Spaghetti Sauce –I just leave out the sausage (or store-bought is ok too). These would also be great appetizers or, paired with a garden salad, an even better dinner. If you’re a fan of quesadillas like we are, be sure to check out my recipe for Grilled Mango Poblano Pepper Quesadillas too! We love experimenting with new combinations. If you love twists on pizza like we do, don’t miss my Whole Wheat Pepperoni Pizza Bites (perfect for lunch or as an appetizer!) or Pepperoni Pizza Pasta Salad recipes! As I mentioned, this recipe appeared on my blog a LONG time ago and when I first featured it, it was part of a #SundaySupper event. 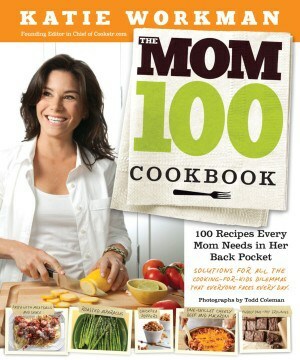 The theme that time was centered around The Mom 100 Cookbook by Katie Workman. Katie’s cookbook is full of solutions for all the cooking-for-kids dilemmas that many of us face every day. She offers up a couple of different quesadilla ideas so I just took that as some inspiration and came up with the Quick and Easy Pizza Quesadillas! 1 cup chopped vegetables like onions, mushrooms, bell peppers, etc. Heat non-stick skillet to medium-high heat (about 300°). Place tortilla in skillet and layer cheese, pizza seasoning and toppings on one tortilla. Top with another tortilla and heat until crispy, about 3-4 minutes. Press down top tortilla into melted ingredients so it will stick together then flip over and grill another 3-4 minutes. *Pizza Sauce: You can use prepared pizza sauce or make your own using a small can of canned tomato sauce with ½ tsp. of pizza seasoning. If you’re not familiar with #SundaySupper, the idea is that we all need to take the time, even if it’s just once a week, to get back to the family dinner table and share our time with family. For generations before ours, it was a weekly tradition and it’s something that we hope to make a tradition once again in households across the globe. Here are some favorites from other bloggers that we are sharing with you during the original #SundaySupper sharing event. I hope you’ll give some of them a try! Be on the lookout for next month’s The Mom 100 Cookbook installment too!